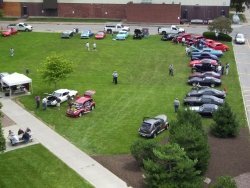 On Thursday, June 24 Kodak Rochester Facilities hosted the 22nd annual Kodak "Show and Shine" Car Show at Gassler Park, which is located in Eastman Business Park, adjacent to building 326. Employees, retirees, on-site tenants and vendors with "special interest" autos and bikes were invited to bring their vehicles in to show off for the day! Despite the questionable weather, the event was attended by over 200 people. There were 29 vehicles on display, dating back as far as 1931. And yes, there was food! AVI Foodsystems provided an outdoor grill service, which included an incredible meal deal. Our perennial DJ, "The Duke of Earl" added additional excitement by playing lots of great "oldies" music and officiating a trivia contest and raffle drawing. There were lots of winners. Among the prizes were tickets to the LPGA and a Pizza Wing Party for 25 that were generously donated by AVI. This has always been a tremendously popular event and a great opportunity to meet with friends over lunch, look at some great vehicles and enjoy the Duke's presentation.